Creamy Fazer milk chocolate with a bit of crunch from chopped hazelnuts. What's not to love? After reading all the great reviews on these candies, I decided to try them myself. These were promptly reordered and placed into all of my holiday gift baskets. Delicious chocolate and if you can try to avoid biting into them right away, it has a slow melt and then the hazelnut flavor really appears. Enjoy! ConsNeed a larger size box. I used to get these when I was a kid, it still taste the same. I fell in love with this candy on my trip to Helsinki. it's so great that I found it is available in the states! Perfectly smooth and creamy chocolate over a soft and flavor rich hazelnut mousse filling. If only the box were bigger! Goes well with a nice hot cup of coffee. This is possibly the best chocolate in the world. I always buy these also for gifts. Highly recommended. You can't go wrong with Geisha; it's one of the best chocolates I've ever tasted. If you're a chocolate lover, you're in for a real treat! 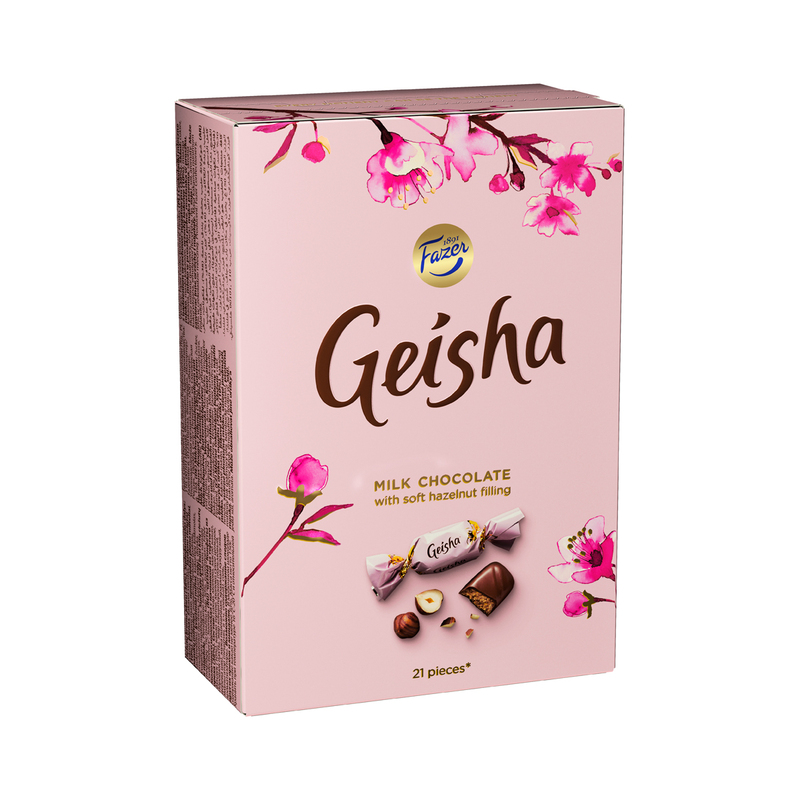 Geisha chocolates bring back so many childhood memories! If you can't go to Finland, you must have these at your Independence celebration! I purchased two boxes of these and two more of the Geisha dark chocolates; the dark chocolates did not arrive. Bigger box would be nicer! Haven't had these in a while and they tasted just like I remember them! A family favorite - arrived fresh and delicious. Delicious chocolate, wonderful hazelnut filling! Safe, delicious candy for my grandchildren's Easter egg hunt! ProsNo high fructose corn syrup, or artificial colorings in this delectable candy! ConsHard to resist eating more than one! Thank you these chocolates were dispatched nicely and were great. Not melted which was excellent!!! My husband's favorite Finnish candy. It is not quite as creamy as Lindt's truffles, one can feel the fine flakes of hazelnuts in the filling, excellent. Yum....a PERFECT combination....Fazer creamy chololate and hazelnut....go for it! I was very happy to find the Geisha chocolate candy online here. I ordered it for my American friends and told them that we have the best chocolate in Europe. After tasting Geisha, they agreed. Be sure not to overlook this gem in your chocolate shopping! Simply outstanding. My Finnish husband's favorite and a true love of the Finns. This made excellent gifts for friends and family so they got to try true, quality Finnish chocolate. A real treat fro everyone! This chocolate is so good you could eat it all up at once.One star missing due to short expiration date. I received a couple of pieces of this candy as a gift and really liked it. I was very happy to see that Finn Style carried it and am sharing it with my friends this Christmas. Melts in your mouth-yum! Thank you for importing this wonderful delicacy from Finland. This is a new addition to the Fazer line. We enjoyed a lot of this chocolate in Finland this summer. What we needed is a "resupply". So glad Finnstyle carries it. My family looks forward to Geisha Chocolate every holiday. It is one of our favorite traditions. These are best when eaten slowly. These packages are great presents and they are a favorite of many friends. I am very pleased with how easy it was to order and the shipment was well packed and did not take long to receive. I would definitely order again. Best chocolate and fast shipping! Fantastic chocolate, the individual wrapped candies are great when you a small piece of Fazer. It's creamy and center is filled with nutty flavor with a little crunch. 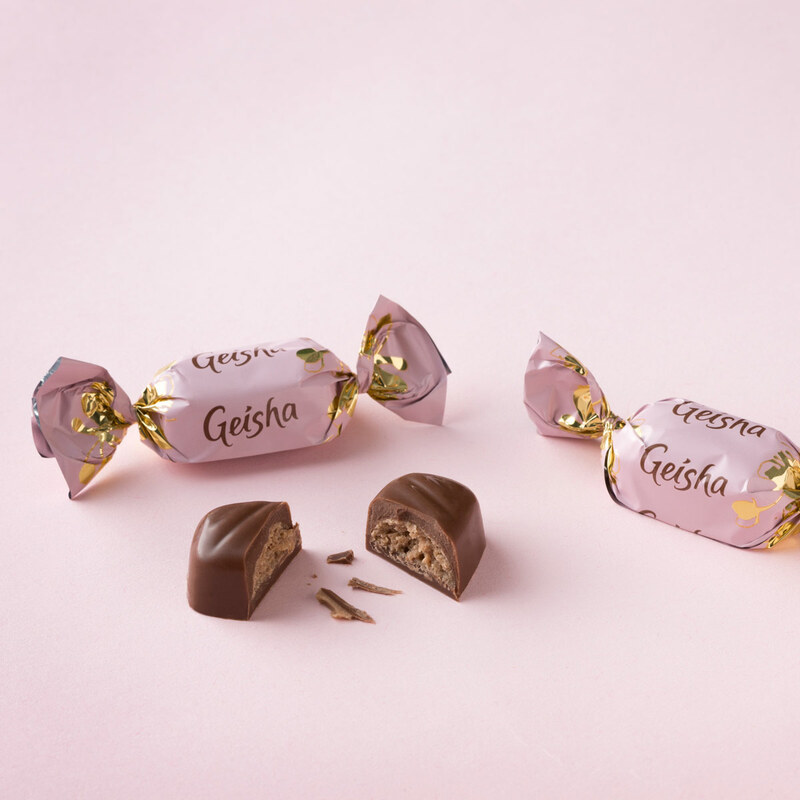 These Finnish Geisha chocolates are a favorite in our house....creamy....chocolate and the perfect bite size....Fabulous!! I was able to try these delicious chocolates 2 years ago from a Finnish friend of mine. I instantly fell in love. I searched for these chocolates forever and finally found them at your website. I'm very happy with my purchase! The chocolates are wonderful, and the shipping was very fast. They came earlier than expected. I bought these for the holidays, and they were enjoyed by all. Will be ordering more (and trying the dark chocolate version!) to give as gifts. I also found them to be a good value for the price. Thanks, FinnStyle! This Chocolate is creamy, delicious and has multiple flavor surprises as it melts in your mouth. I ordered four boxes of it this Christmas and gave them as presents. Everybody loves it. ProsIt is amazingly fresh and reasonably priced for an import chocolate. Usually, unfortunately, as you buy European chocolates at a typical grocery store, the chocolates are not fresh. (not Fazer chocolate, which I cannot find in stores). A treat for one, or many. Great decadence in a small package, Geisha chocolates are a lovely, nutty treat to be enjoyed by oneself or shared with (only good) friends. If you like hazelnut and chocolate Fazer Geisha is the way to go. One of my favorites. Tha best chocolate palatal experience yet!!!!! Smooth, creamy and not too sweet. Fazer makes the best chocolate inthe world. Geisha is one of my favorite chocolate. Its creamy with hint of hazelnut. When I was an exchange student in Finland, I got hooked on this delicious chocolate. I would like to place an order but I need to know about the expiration date. What is the expiration date ? Please respond asap so I would place my order asap. thank you. Will you be getting anymore of the Geisha candy in and if not where else can I order it. We currently have Geisha in stock, however due to freezing temperatures we have had to put a hold on shipping them out. Due to the cold temperatures, the wrappers are breaking and disintegrating so the candy arrives unwrapped. Once the temperatures settle, we will make this and the Fazermints available for purchase. Our apologies for any inconvenience.